Augusta Health has received the Healthgrades 2018 America’s 50 Best Hospitals Award™. This is the fourth consecutive year that Augusta Health has been awarded this recognition for clinical quality. It had been recognized as one of America’s 100 Best Hospitals for several years prior to being named a 50 Best Hospital. This recognition means Augusta Health is among the top 1% of more than 4,500 hospitals nationwide for its consistent, year-over-year superior clinical performance as measured by Healthgrades, the leading online resource for comprehensive information about physicians and hospitals. 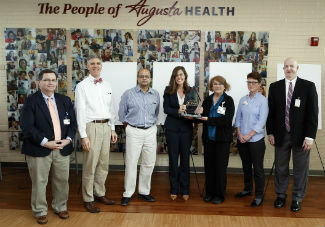 The America’s 50 Best Hospitals Award was presented to Augusta Health physicians and staff on Thursday, February 22 during the quarterly Values Celebration. “Because this award recognizes overall clinical quality, it is a great reflection of the excellent care that our medical staff, employees and volunteers provide to the community. It demonstrates more than expertise; it represents the teamwork and professionalism required to deliver very high-quality care. The professional clinical teams—physicians, nurses, therapists and technicians—are very visible to patients and families. They do an outstanding job. Just as important are also hundreds of other employees who are not always noticed—those in environmental services, nutrition services, maintenance, human resources, registration, billing and every other department. All of these people who work together as team to provide our patients with the best care and outcomes,” said Mary N. Mannix, FACHE, President and CEO of Augusta Health. Augusta Health is one of two hospitals in Virginia to receive the American 50 Best Hospitals Award this year, and the only hospital in the Shenandoah Valley to receive it. According to Healthgrades analysis, from 2014 through 2016, patients treated in hospitals that achieved the America’s 50 Best Hospitals Award™ had, on average, had a 26.2% lower risk of dying than if they were treated in hospitals that did not received the award, as measured across 19 rated conditions and procedures where mortality is the outcome. Recent quality initiatives implemented by Augusta Health include a sophisticated Automated Surveillance for Sepsis Alerts, processes and procedures that have significantly reduced the number of CLABSI (Central Line Associated Blood Stream Infections), standardized processes or ‘bundles’ while closing the incision following colon surgery and implementation of a Just Culture program to improve patient safety. Augusta Health was also recognized with the Orthopedic Surgery Excellence Award™ and the Joint Replacement Excellence Award for a third consecutive year. Additionally, Augusta Health received Five-Star Distinctions in Total Knee Replacement, Total Hip Replacement, Hip Fracture Treatment, Treatment of Pneumonia, and Treatment of Chronic Obstructive Pulmonary Disease. The 50 recipients of the America’s 50 Best Hospitals Award™ are distinguished for overall clinical excellence across a broad spectrum of care. During the 2018 study period (2014-2016), these hospitals showed superior performance in clinical outcomes for patients in the Medicare population across at least 21 of 32 of the most common inpatient conditions and procedures —as measured by objective performance data (risk-adjusted mortality and in-hospital complications). To learn more about how Healthgrades determines America’s 50 Best Hospitals Award ™ recipients, please visit www.healthgrades.com/quality. Augusta Health is an independent, community-owned, not-for-profit hospital whose mission is to promote the health and well-being of its community through access to excellent care. Named one of the 100 Top Hospitals in America by Thomson Reuters/Truven in both 2011 and 2012, Augusta Health has also been nationally recognized by HealthGrades as one of America’s 50 Best Hospitals for clinical excellence and patient safety for four consecutive years. For more information about Augusta Health, its programs or its services, please visit the website, www.augustahealth.com.